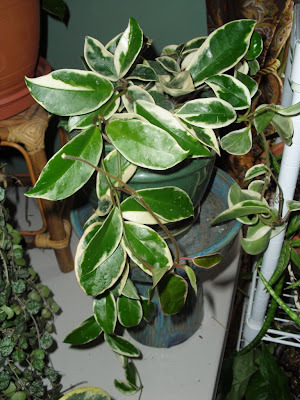 Even though I am an inveterate plant collector by temperament, there was one particular collecting bandwagon that I resisted jumping on: Hoyas. I remember when Garden Web first created a Hoya Forum. It was immediately extremely popular, and remains so, unlike a lot of their forums dedicated to a single genus or family. The people who posted were enthusiastic, no, passionate about these plants. More than one person described waiting impatiently for new plant shipments to their local big box stores, and expressing huge disappointment if there were no Hoyas. New mail-order sources were shared, and as I understand it, they sold out of plants quickly. 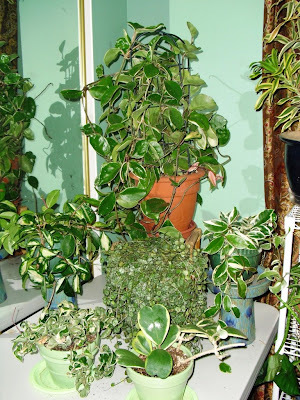 On the House Plant forum, when anyone would ask for suggestions about what sort of new plant they should buy, Hoyas were always suggested, usually by multiple posters. Hoya, Hoya, Hoya, it was all about the Hoyas. My six Hoyas. This a rare thing for me--a completed collection. I like the plants I have, but I'm not looking to add any more. Click this, and all other photos, for larger versions. This shot in particular is much clearer when seen full sized. Okay, I thought, they are nice enough plants, but why is everyone so excited? One thing that was mentioned frequently was the scent of the flowers. So the next time I was at a nursery and came upon a plant in bloom, I sniffed it. Well, the fragrance was nice, but not all that noteworthy, at least not to me. 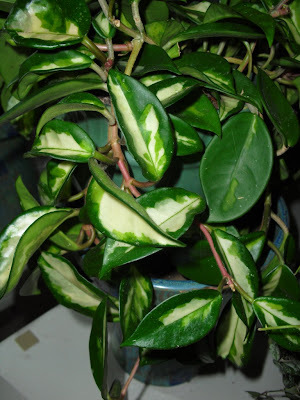 The leaves, again, are nice, but with the exception of Hoya carnosa compacta, (also known as Hindu Rope or Krinkle Kurl, among other variety names) not at all unusual or eye-catching. I just didn't get it. But having had an inexplicable plant passion or two of my own, I stopped wondering about it. 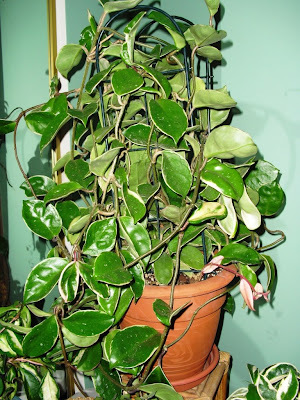 Just like other things in life, certain plants just move certain people, and Hoyas didn't do it for me. It's been nice. I have found it attractive and easy to grow. It loves my east window and does well going almost dry between waterings. Now that it is large, it does bloom, and the flowers are interesting, and they have a nice, subtle fragrance. Hoya curtisii leaves. The full plant is shown directly in front of the 'Krimson Queen' in the group photo. 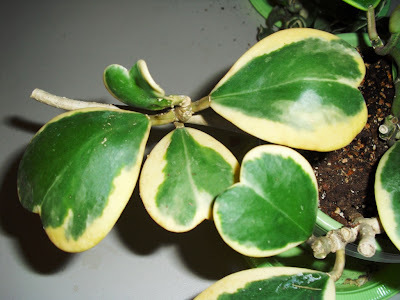 Hoya kerrii has nice, heart-shaped leaves. So there you have it. I never sought them out, I was never excited about them. But if I saw a plant I liked, I bought it. What can I say: they're nice.